IS THIS THE BEST SITE FOR YOU? There are many sources of information about self-deliverance on the Internet or in books (there are even several organisations called ‘Exit’!). You have found the original group, Exit, based in Scotland in 1980, that specialises in self-euthanasia research & information backed up by extensive, published scientific evidence. In 1980, EXIT published How to Die With Dignity. This was the first ever guide to self-deliverance anywhere in the world. Bag materials when using plastic bags and drugs – explaining why some suicides failed even though popular instructions had been followed to the letter. In 1995, EXIT published Beyond Final Exit. For the first time, scientific errors concerning the dangerous use of certain over-the-counter suicide drugs were exposed, and more accurate knowledge regarding their correct use made public. In 2007, EXIT published Five Last Acts. This pioneering book showed a variety of safe, dignified means to bring one’s life to a close and, for the first time in any self-deliverance guide, explained how to use compression for a peaceful end in an emergency situation (such as confinement in hospital) where methods such as helium would be impossible. In 2010, the second, greatly expanded version, Five Last Acts II, became a new standard. It responded to critics, providing new evidence to solidify and support the techniques it had pioneered in the first edition, reassuring readers worldwide of a peaceful, dignified death. Hailed as, “the most comprehensive guide to self-deliverance techniques available,” it quickly became a new standard. With more pages than other leading manuals put together, Five Last Acts II breaks new ground in comprehensiveness and reliability. Its knowledge is supported by over 400 scientific citations, allowing the reader to confirm that accuracy of its data. In 2013, The Exit Path, the major textbook on self-deliverance, is published worldwide. 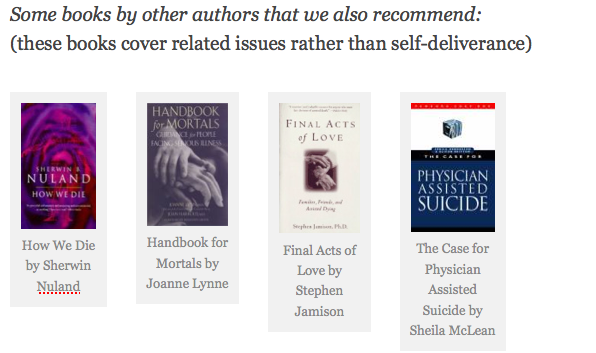 In 2015, leading specialist notes published from our conference seminar, Self-euthanasia, methods & dialogues. In 2015, amid growing concerns over some helium tanks, Exit published the world’s first guide to using nitrogen for self-euthanasia. We don’t just say, “Trust me, I’m a doctor:” we prove to you, beyond any reasonable doubt, that the information provided by us is information you can count on. And, when it comes to orchestrating your own departure from this life, that’s exactly what you need. By supporting EXIT, you support the research that facilitates empowerment, for people living now and tomorrow, empowerment that allows an individual to choose the time and manner of their own death. That empowerment can allow us all to lead happier and more fulfilled lives, secure in the knowledge of how to handle an unknown future. People have been trying to change the law since 1935. It’s a long wait. We are the organisation that cares about what happens to people now, and in the years to come before aid-in-dying is available to all those who validly seek it. Exit is an international society formed in 1980 with the specific purpose of researching and making available reliable information on how to end one’s life if faced with unbearable and unrelievable suffering. 1. Many organisations work for a change in the law, a change which will potentially help people in the future. Exit works on research in self-deliverance (also called self-euthanasia or rational suicide) to help people that need it now. 2. Quality of research. Please feel free to compare the quality of Exit’s work against any other source and to compare our books with any other books on the market. Our work is richly annotated and supported with the best academic knowledge in the field. We don’t just ask opinions: we find out. In this way, Exit is a major source not just for individuals but for other organisations worldwide. Even with today’s knowledge, many people die badly when choosing the time of their own death. By helping Exit, you help to increase good deaths. The Blog is primarily for members, but anyone can subscribe to updates. Note that we do not publish “how to” information on the website as we work within U.K. law. If we did not, we would not be able to do what we do. Neither are our books on Amazon meant for those just browsing. 750-page technical books are very expensive to research and write: we cannot “give them away” even if it was legally and ethically acceptable to do so. If you want a very inexpensive manual, try Derek Humphry’s Final Exit. If you are looking for an illegal website with unqualified opinions on methods of suicide, you are in the wrong place, please look elsewhere. Readers please note that Exit is not connected with the Australian-based ‘Exit International’ group, its activities, publications, workshops, or methods of working. A not-for-profit organisation, Exit is one of the leaders in the field of self-deliverance, publishing explicit information on end of life for competent adults. (Proof of age is needed for joining the Society as a member.) ‘Hands-on’ workshops are conducted around the UK. Exit’s information is distinguished by quality scientific research. All our new books demonstrate the scientific backing behind any advice using extensive references accompanying the easy-to follow instructions and diagrams. Methods detailed in our printed literature include helium, compression, starvation, drugs and exit bags. The larger volumes examine scientific evidence behind other methods as well, including fringe methods. We examine safeguards, painlessness, how to avoid failure and how to ensure a peaceful, dignified death. Much of our information is not available in other books. EXIT works strictly within the law of Scotland and the UK. It is not an emergency service. It does not provide one-to-one information on suicide (other than in workshops or literature), and takes all reasonable precautions to avoid material falling into the wrong hands. Exit’s wider remit includes legislative reform, improved palliative care for all, provision of living will information, and an end to ‘postcode lottery’ on health service. The EXIT Euthanasia Blog provides comment, analysis and news on selected news items of interest to Exit members. Comments are welcome, but they should relate to the post, not ask questions or seek guidance on suicide that is outside our remit of what we publish online. This is not a discussion website. All comments are moderated and inappropriate are deleted. Exit’s attitude to law reform is one of carefully constructed permissive legislation – a judicial system that can permit exceptions to the rule against assisted suicide or euthanasia. This differs from the prescriptive model used in most proposed bills. Exit’s position on allowable limits is not dissimilar to the Dutch model, basing consideration of end-of-life assistance upon i) unrelievable and unbearable suffering and ii) the patient’s competent and enduring wish, as the two primary requisites. This differs from organisations that campaign only for the terminally ill.
Exit is predominantly a low-profile organisation. It values consensus-building as a stable means of producing change. The political question for parliamentarians and others that dissent from legal reform in this area may be, how can the enduring views of the large proportion of the population, supported by the weight of rigorous academic evidence, be consolidated by a democratic government that is opposed to assisted suicide and voluntary euthanasia on principle? Exit uses the Carver System of Policy Governance as its working model for Board deliberations and the running of its organisation. It focusses on being pro-active rather than reactive, and outward-looking rather than inward-looking. Imitation might be the sincerest form of flattery, but Exit is not connected with more recent groups of a similar name such as ‘Final Exit Network’ (American) or ‘Exit International’ (Australian). Exit has members worldwide but is neither a member of the World Federation of Right to Die Societies or other groups claiming to represent the ‘movement.’ We respect all these groups but have a fiercely independent and carefully scrutinised approach to our work. Publications (for more information, please see here). Exit publishes a magazine, Exit Newsletter, that includes lay and academic articles as well as straightforward information, humour and readers’ experiences. EXIT’s literature includes the groundbreaking booklet Departing Drugs, and the modern, most thorough and inclusive work on methods of self-deliverance, Five Last Acts. It also published How to Die With Dignity, the first book of its kind anywhere in the world. Departing Drugs researchers were also the main authors of the self-deliverance publication Beyond Final Exit and have contributed to major publishers in the fields of law, ethics and medicine. The most recent work is a large volume called The Exit Path. Exit has also written articles that have appeared in the British Medical Journal, contributing chapters in the LexisNexis legal guidance series, and academic chapters in the Dartmouth series of medical ethics textbooks for undergraduates and postgraduates. Five Last Acts 2nd edition is available to members and non-members. (Please consult the right hand column for details.) Even with modern technology, not all ends are good ones. Although palliative care continues to make great strides, the final hours or days of some people are so difficult that they elect to take matters into their own hands and end things sooner rather than later. Once that decision is taken, lack of knowledge, planning or preparation can result in even greater suffering. Five Last Acts collects the wisdom of multi-disciplinary research, workshops and developments worldwide in a major new volume. The body of the work is written in easy-to-understand language to offer a practical guide for every reader. Technical explanations are reserved more for the appendix. Five Last Acts provides the reliable options for the last act in your own play. A subsequent edition (nearly twice the size) called The Exit Path gives an even more comprehensive overview. These are in-depth works compared to the much less expensive guides from other sources. They are based on many years of collected research and produced at a fraction of the cost that such a book would normally be priced. The new edition of Five Last Acts is completely revised and expanded, giving even clearer insights and the most comprehensive guidance on self-deliverance worldwide. Chris Docker is an established writer in Law and Ethics in Medicine, producing key works for the professions, academics and the public on topics that include living wills, death & dying, and human transplants. For over 15 years he has been one of the world’s leading researchers into the reality of “self-deliverance” – the methods to accomplish one‟s own easy, peaceful and dignified death – when all other measures to relieve suffering and indignity have failed. He is Director of Exit and has led the interactive workshops run for many years across the UK. He holds a Masters Degree in Law & Ethics in Medicine. Five Last Acts is his third book on self-deliverance. Departing Drugs (principal author) 1993. Beyond Final Exit (co-author) 1995. Advance Directive / Living Wills, in: Contemporary Issues in Law, Medicine and Ethics (ed. S.A.M. McLean) 1996. The Way Forward, in: Death, Dying and the Law (ed. S.A.M.McLean) 1996. Living Wills, in: Finance and Law for the Older Client (Society of Trust and Estate Practitioners, Gen.Ed. C.Whitehouse) 2000 (up-dated 2003). Ethical and Legal Dilemmas with Organ Transplants, in: Health Services Law and Practice (eds: M.Bloom, A.Harris,S.Waddington) 2001. End of Life, in: Health Services Law and Practice (eds: M.Bloom, A.Harris,S.Waddington) 2001. Five Last Acts 2007 (2nd edition, 2010). Self-Euthanasia Methods & Dialogues 2015. EXIT’s website (Euthanasia Fast Access) provides a resource for students and members. It does NOT contain specific information on suicide.